University trustee Mark Shenkman donated $5 million to the University's career center. University trustee Mark Shenkman donated $5 million to the University’s career center. When Mark Shenkman was considering making a donation to his alma mater, administrators showed him several residence halls and lobbies they could rename to honor the largest-ever gift from a sitting trustee. Shenkman said he chose Ivory Tower, which opened in 2004, to bear his name because it was worthy of a $5 million gift. “I thought it would give me the recognition I wanted. It was a large residence,” Shenkman said in an interview last week. The gift will boost the University-wide career center’s budget by $3 million, adding funds that could be used for advising resources or unpaid internship programs. It will also funnel $2 million into career services in the business school. After encouragement from University President Steven Knapp, Shenkman said he chose to donate to career services to help give students an advantage once they enter the “real world.” He said too often students go through college without learning skills like writing a resumé or sitting for a job interview. Shenkman has previously given gifts to the business school’s annual fund and supported Veterans Memorial Park’s move to its current location in Kogan Plaza last year. He said he would consider giving to the business school or the Graduate School of Political Management in the future. “That’s something I have an interest in,” he said. Shenkman said he spent about a year in conversations with Knapp and Mike Morsberger, the vice president of development and alumni relations, before he and his wife Rosalind decided to donate. 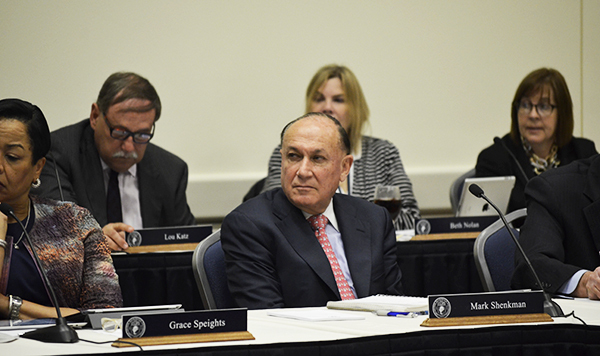 “There was a lot of discussion and a lot of review because we needed to make sure the money will be used efficiently and successfully and that the importance of the gift is recognized by the University,” Shenkman said. “At the time, it was one of the fanciest halls in America, and so ‘Ivory Tower’ had a bit of panache and was a little tongue-in-cheek, but I’m happy to see it go and am delighted to see it named after such a fine family. It’s a home run,” he said. 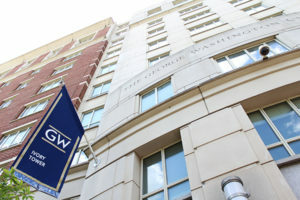 Trachtenberg said he renamed several dorms on campus after arriving at GW to replace the generic street numbers that originally labeled the dorms. “You had to call them something because it’s terribly unattractive just having an address,” he said. After it was called New Hall for more than a decade, the H Street building was renamed Amsterdam Hall to honor a former member of the Board of Trustees who left $5 million to the University. Ivory Tower will be renamed Shenkman Hall. GW has struggled to land gifts to name buildings, as donors are more interested in funding scholarships or endowed professorships. For example, fundraising for the Science and Engineering Hall stalled this fall after the University struggled to pull in the $75 million needed from outside sources to pay for its most expensive project to date. Morsberger said it is especially hard to pull in donations once a building is completed, so fundraisers try to build on the anticipation of a soon-to-be completed project before the ribbon is cut. About eight residence halls on campus aren’t named for donors or alumni, including Potomac House and City and West halls. GW held a contest earlier this year to name the ‘superdorm’ after it did not lock in a donor to give it a name. The $130 million residence hall will be named District House after about 400 options were submitted. At the public health school’s ribbon cutting on Thursday to open its new $75 million building on Washington Circle, financier and philanthropist Michael Milken pointed specifically to Shenkman as the person who convinced him to donate $50 million in a two-part gift to name the school. Shenkman said he spent years encouraging Milken to give to GW by telling him the best way to make an impact in the public health world was to cement himself in D.C.
“I’d tell him about the great future GW has,” Shenkman said. He added Milken was impressed by the school’s location, Dean Lynn Goldman and the new building. Like Milken, Shenkman is known for pioneering the junk-bond market in the 1980s and 1990s. Shenkman graduated with an master in business administration in 1967, and is the president, chief executive officer and chief investment officer of Shenkman Capital Management, a wealth management firm that specializes in the high-yield, junk-bond market. Shenkman also authored one of the first business school textbooks about the junk-bond market in 1999. The University has historically struggled to land big gifts, though Morsberger said Friday that GW will beat its previous record by landing more than 21 gifts that top $1 million before the end of this fiscal year. Morsberger said Friday that those gifts, which include several still in the pipeline, will help the University generate the excitement it needs to launch a $1 billion campaign, which will pour resources into construction, faculty and academic programs.